About Us. Jsl Bathroom suites. Bradford. Yorkshire. OVER A HUNDRED BATHS ON DISPLAY. CERAMICS And PLASTICS STOCKISTS. Bradford Warehouse. Map. Over 80 Colours In Discontinued And Obsolete Bathroom Product Ranges. Est. 1978. 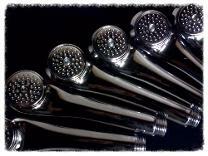 WE STRIVE FOR THE HIGHEST STANDARD IN QUALITY And DURABLE BATHROOM PRODUCTS. Five Minutes Walk From Bradford City Centre And Bradford Interchange Bus And Rail Station. About Us Business Overview Map And Details JSL Bathroom Suites Bradford Yorkshire. Specialising In Complete White Bathroom Suites And Discontinued Obsolete Bathroom Spares And Replacements Parts Since 1978. All At Low Trade Prices... Even To The Public. Most Items Stocked And Ready To Take Away The Same Day. Thank You For Making JSL Bathroom Suites Your First Stop For All Your Bathroom Requirements. Whether It Is A Complete White Or Colour Bathroom Suite Or Just A Spare Part. Serving Scotland. Inner And Outer Hebrides. Aberdeen. Glasgow. Dundee. Edinburgh. Perth. Inverness. Stirling. Serving England. Bradford. Sunderland. Newcastle. York. Leeds. Manchester. Nottingham. Sheffield. Hull. London. Derby. Bristol. Birmingham. Liverpool. Serving Wales. Cardiff. Swansea. Newport. Wrexham. Rhyl. Caerphilly. Pontypridd. Llanelli. Most Of Our Products Are Proudly Made In The U.K. And E.U. About Us Where We Are Map How To Find Us. 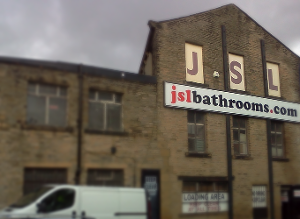 JSL Bathrooms Bradford Yorkshire. 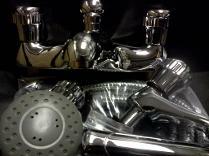 Specialising In Obsolete Bathroom Fittings, Baths, Basins, Toilets And Taps In Discontinued Lines And Colours. We Also Sell Complete Contemporary Bathroom Suites In Many Ranges To Suit Low Or High End Budgets And Have Been Based At Our Bradford Premises On Carter Street (Just Off The A650) Since 1978. One Of The Reasons Why We Have Been So Successful Over The Decades Has Been Our Firm Commitment To Low Prices On Good Quality Merchandise. Our Respect For, And Devotion To Our Customers Needs Has Seen Us Gather A Loyal And Valued Customer Base, That Reaches Far Beyond Our Roots In Yorkshire. It Is A Great Compliment To Our Business Ethic And Practice, That After So Many Years Of Trading We Continue To Supply Both The Same Loyal People, And New Customers Alike With Their Bathroom Equipment. Our ethos has always been to buy locally produced goods from local manufacturers. Hence most of our stock is British Made, and most of that made right here in yorkshire. From the likes Of Aquarius Bathrooms Of Halifax. Spring Bathrooms Of Leeds. Shires Bathrooms Of Bradford. Derwent Macdee Of Doncaster. Trojan Plastics Of Huddersfield. Designer Products Of Dewsbury And Many More Local Manufactures Including Cameron Plastics Of Skelmersdale. Roman Products Of Lancaster. Twyford Bathrooms Of Alsager. Beyond The reaches of norther england we then move on to the midland metal companies and up to barrhead in Scotland. We also import certain specialist pieces that cannot be sourced in the U.K. from Germany, Portugal, Spain, Italy and beyond. But wherever possible we choose to stock as locally produced goods as possible, and always have. Long before it became fashionable. We Regularly Have Customers Collecting Rare Parts And Suites From The Likes Of Manchester, Glasgow, Newcastle, Liverpool, York, Doncaster, Sunderland, Leeds, Derby, Nottingham, Sheffield, Wakefield, Barnsley, Hull, And Of Course From Our Native Bradford. 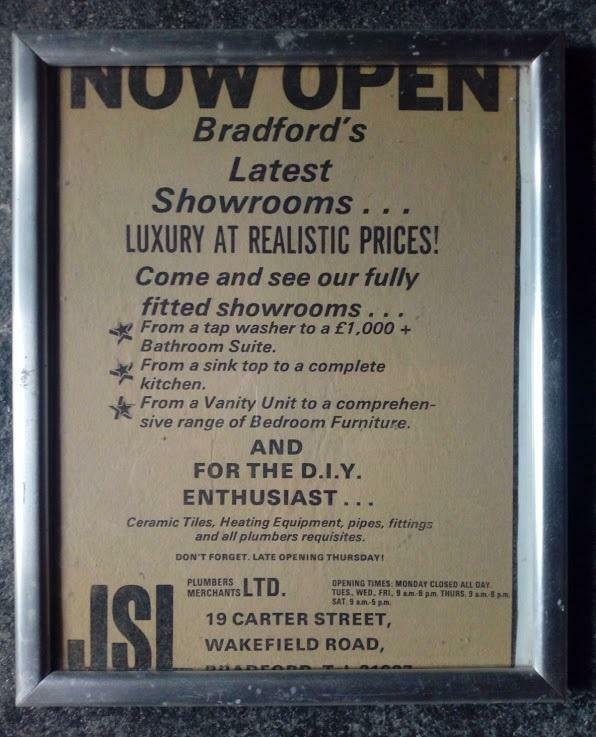 An Early advertisement in the Bradford Telegraph and Argus Newspaper. Circa late 1970s. Most of our products are made in the U.K and E.U. Aquarius Armitage Shanks Balterley B.C. Sanitan Bemis Boch Bristan Buades Carron Cascade Celmac Cesame Derwent Macdee Esmaltal Giessdorf Heatons ICI Ideal Standard Imperial Bathrooms Impulse John Sydney Kan77 Karat Lecico Lefroy Brooks Lotus Mandarin Pressalit Qualcast Ram Royal Doulton Selles Serel Shires Sorel Spring SRC Stelrad Doulton Tantofex Thomas Dudley Topravit Trent Trojan Plastics Twyford Valadares ULS Vavid Vernon Tutbury W. Adams Westminster Wirquin and More. Almond Alpine Blue Avocado Aztec Gold Bahama Beige Bali Brown Bermuda Blue Burgundy Cameo Pink Caspian Chablis Champagne Coral Pink Damask Gazelle Harvest Gold Haze Honeysuckle Indian Ivory Jade Kashmir Beige Linden Green Misty Blue Green Grey Peach Oyster Pacific Blue Pebble Pink Pampas Peach Penthouse Brown Red Pergamon Primrose Romany Sandalwood Sepia Sky Blue Soft Cream Soft Mint Soft White Sorrento Blue Sunking Turquoise Wild Sage Willow Green Wychelm and More. JSL Means Bathrooms In Any Language.